My stay in Dubai was absolutely fantastic. The city has a lot to offer and there’s a lot to see (read my Dune-bashing experience here). Also concerning accommodation there are a lot of different options. 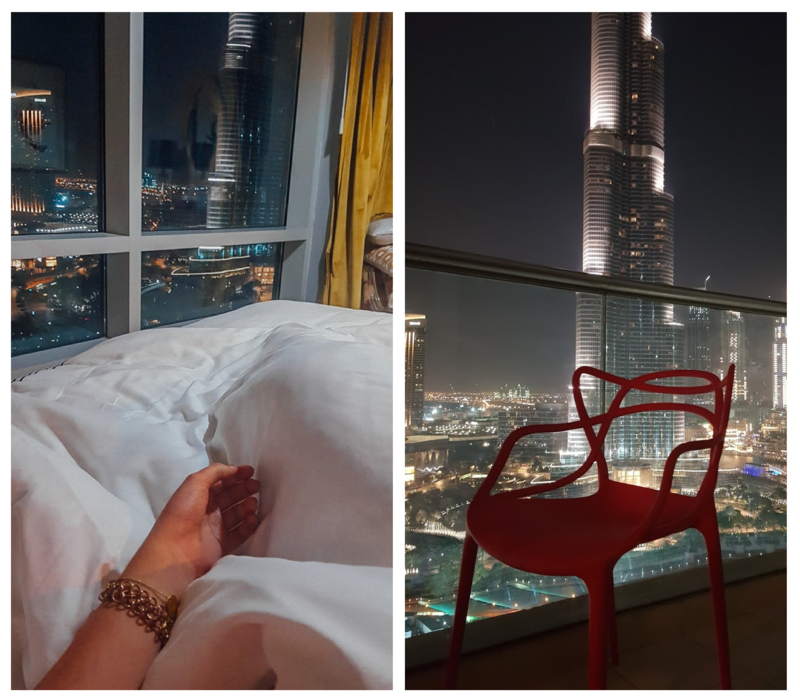 I stayed in a beautiful apartment called DreamInn Dubai and in this blogpost I tell you everything about it! One of my main goals while visiting Dubai was to see the magical Burj Khalifa from up close. 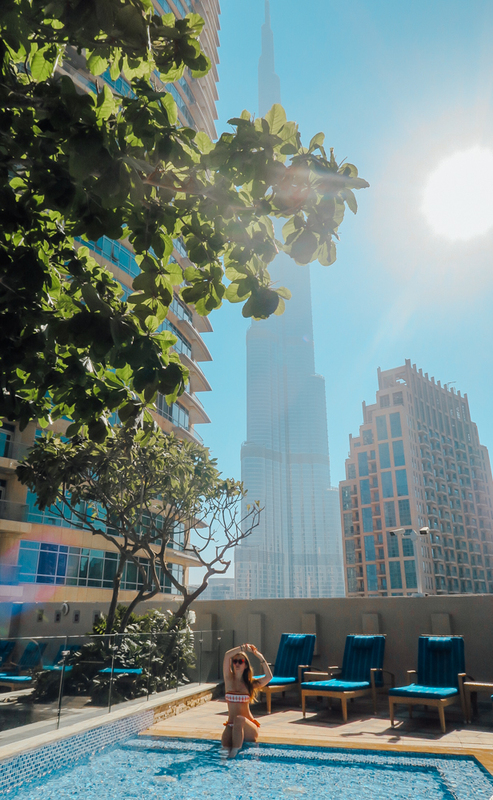 That dream definitely came true when I walked into our magical apartment in Downtown Dubai which had an amazing view on the world’s tallest tower. Besides that, the inside of the apartment in the Loft East Tower was absolutely beautiful. With very classic furniture, two bedrooms, two bathrooms, a kitchen, television and two big balconies the place has everything for an amazing stay. In the building there’s a pool and gym at your disposal. Our stay was absolutely amazing, that’s for sure. Really no negative aspects about this stay. But of course, the thing I loved the most was the amazing view when waking up. We we’re sitting on the balcony in the evening sipping some tea and just enjoying the view. From the apartment, which is on the 17th floor, you can also see the lightning show and the fountain shows in the evenings. For people who want that little more, DreamInn also has a lot of services at your disposal. There are different optional possibilities such as a private chef, butler services but also coffee and breakfast services. I always find it very nice to stay in an apartment as you really can do your own thing without being chained to a hotel. Voor Bianca: ook ik had vliegangst. Tot mijn vriend vroeg of ik ter plekke in een vliegtuigje wilde stappen voor een vlucht boven onze woonplaats. Ik mocht ja en ik mocht nee zeggen. Ik wist dat als ik nee zou zeggen ik met mijn angst zou blijven zitten. Dus ik heb ja gexegd en een half uur later zal ik alleen in het vliegtuig. Mijn vriend ging niet mee. Sindsdien wil ik niks liever dan met het vliegtuig op vakantie. Prachtige foto’s! Dubai zou ik ook nog wel eens heen willen. Toch zijn het landen die mij ook weer geheel niet trekken. Zo gemaakt. Wat een prachtige foto’s. Je ziet gewoon dat je geniet van het verblijven daar! De eerste foto beneemt je toch de adem! Zoveel hoge gebouwen. Ik krijg spontaan al hoogtevrees. 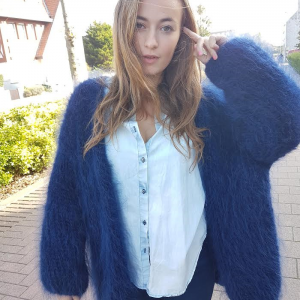 Woow….prachtig daar! Geweldig vakantie heb je gehad. Voor mij alleen in droomland dat ik naar Dubai ga.